Genesis chapter 23 records the account of Sarah’s death and Abraham’s subsequent purchase of a field in Hebron which contained a cave for her burial. Sarah was hundred and twenty-seven years old when she died in Hebron in the land of Canaan. Kiriath Arba which means the “city of the four” was the earlier name of the city which was changed to Hebron after the conquest of the Promised Land. Abram took his wife with him when he set out from Harran to settle in the land of Canaan. Sarai was ten years younger than Abram. When Abram left Harran and set out for the land of Canaan, he was seventy-five years old and Sarai was sixty-five years old. Sarai is the fourth woman mentioned by name in the Bible, and the first woman named who is in the line of Seth. She became the matriarch of the Hebrew nation. Sarai name had been changed by the LORD to Sarah. “Sarai” means "my princess", but “Sarah” means simply "Princess", indicating that she was to be exalted, not only by her husband but by all nations. For sixty-two years, from the age of sixty-five to hundred and twenty-seven years old Sarah sojourned with Abraham before she died in Hebron. Since Abraham was not a native of Canaan but a foreigner, he did not own any property and desired to purchase some land to give Sarah a proper burial. Although pagans would often cremate the bodies of their dead, those who worshipped the LORD God would return the body to the ground from whence it came (Genesis 3:19). Today Orthodox Judaism requires strict adherence to sacred funeral and burial practice. Orthodox Jews believe that a person’s body will be resurrected and that there is a physical life after death. Jewish law stipulates that the body must be buried as quickly as possible following death. The body is laid to rest in a simple wood coffin and the body is never embalmed. In Genesis 17:8, the LORD promised Abraham that the whole land of Canaan, where he was residing as a foreigner, would be given to him and his descendants after him as an everlasting possession. But at the time of Sarah’s death, he did not own even one foot of land to bury his wife. We know from the account in Genesis 14, at the time Abram had rescued his nephew Lot, he had 318 trained men at his command who were born in his own house. This number of men was an indication of Abram’s wealth and power. Including women and children, there were probably more than 1,000 persons under his authority and enough corresponding numbers of flocks and herds to feed, clothe and provide shelter for all of them. Subsequently, the LORD cut a covenant with Abram (whose name means, “Exalted Father”) and renamed him Abraham (whose name means, “Father of Many Nations”). Abraham’s wealth increased further after he had stayed in Gerar. Abimelech took sheep, oxen, and male and female servants, and gave them to Abraham along with a thousand pieces of silver. Abraham was considered to be a mighty prince by the Hittites and they offered him one of their tombs in which to lay the body of Sarah. The custom of employing an intermediary between a purchaser and a buyer still exists today in the middle and far eastern regions of the globe. Abraham didn’t want to offend Ephron by directly approaching him concerning the purchase his property, so Abraham asked the Hittites to speak to Ephron on his behalf. Abraham had expressed interest in purchasing the cave that belonged to Ephron. Ephron replied that he would give Abraham the cave as well as the field where the cave was located. This is an Oriental bartering technique. 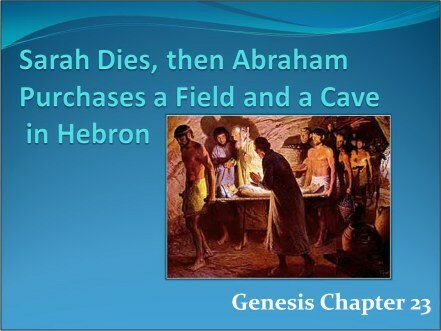 Ephron’s actual intention was to make it known to Abraham that he was willing to sell both the field and the cave to him or that he would give them to him but expected generous gifts in return. By bowing before them again, Abraham showed great respect and honor to both the people and to Ephron. His act of humility also got their attention and signified that he wanted them to pay attention to what he had to say. Abraham was not looking for a bargain but was willing to pay the full price for the field. Ephron understood that Abraham wanted to buy the field and not receive it as a gift. Therefore, he told Abraham the price of the land. A shekel is 2/5th of an ounce of silver. Four hundred shekels totals 160 ounces or 10 pounds of silver. Since Abraham and Ephron were both wealthy, Ephron declared that the price really wasn’t an issue between them and that the matter was settled. After the terms were settled and witnessed by the people, Abraham immediately paid Ephron the full price for the land. In return, Ephron deeded the field, the cave and all the trees on the property to Abraham. The death of Sarah and the transaction for her burial place must be very significant since an entire chapter of the Bible was devoted to preserving a written record of those proceedings. The importance is that there is an historical record that establishes the fact that Abraham and his descendants legally possessed property in Hebron. In Genesis 14:13 Abram is referred to as “the Hebrew”. This is the first time that this descriptive term “Hebrew” is mentioned in the Bible. The term, Hebrew commonly refers to Abraham’s descendants. Abraham’s son Isaac never left the land promised to him. Isaac lived out his days in the areas of Beersheba and Hebron. Isaac’s son Jacob bought his older brother Esau’s birthright for a bowl of lentil stew. Jacob then deceived his father Isaac into giving him the blessing that was intended for Esau (Genesis 27:36). Jacob fled for his life to his Uncle Laban in Harran and lived there 20 years before returning home. Jacob stayed in the land promised him until God told him to leave. At the age of one hundred thirty Jacob began the journey to see his son Joseph in Egypt. The sons of Jacob and their families were called “Hebrews” as they dwelled in Egypt where their descendants were enslaved for 400 years. During the Exodus, the Hebrews (the people who descended from the tribes of Jacob) were delivered from the furnace of affliction and emerged as the Nation of Israel. 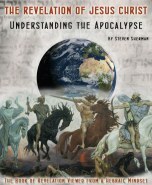 After the death of King Solomon, the Nation of Israel was divided into two kingdoms. The Northern Kingdom consisted of ten tribes and was also known by the name of the largest tribe, Ephraim. The Southern Kingdom consisted of two tribes and was also referred to by the name of Judah. Eventually because of evil rulers and great apostasy, the Northern Kingdom was defeated and taken captive by the Assyrians and the northern tribes scattered. Approximately one hundred and twenty five years later, the Southern Kingdom went into captivity in Babylon. Those captives who returned to the land seventy years later were known as Jews. Today the term “Hebrews” commonly refers to the Jews. 2) Ever (usually Anglicized as “Eber”), is the ancestor of Abraham. Eber was a great-grandson of Noah's son Shem and the father of Peleg. According to Jewish tradition, Eber, refused to help with the building of the Tower of Babel, so his language was not confused when it was abandoned. He and his family alone retained the original human language, Hebrew, is a language named after Eber. Eber was one of the bearers of the monotheistic tradition which he had learned from his ancestors Shem and Noah and passed on to his grandson Abraham. Since Abraham was both a descendant and disciple of his, he is called an “Ivri” – a Hebrew. 3) The rabbis held that the word is a reference to the fact that Abraham came from the other side and crossed over the river and was not a native Canaanite. “Ivri” also refers to the fact that Abraham spoke the Hebrew language—thus named because of its ancient origins, preceding the development of the other languages current at that time. So Hebrew means the one who has crossed over, but is opposed, on the other side, and different from all others. Abraham was a solitary believer in a sea of idolatry. The Hebrews are a people whose native tongue is the Hebrew language. Abraham and Sarah, Isaac and Rebekah, and Jacob and Leah were all buried in Hebron. Hebron is the site of the oldest Jewish community in the world. It was the chief city in the hill country of Judah (Joshua 15:54) and was both a Levitical city (Joshua 21:11) and a city of refuge (Joshua 20:7). Caleb captured the city for Israel (Joshua 15:13-14). King David was anointed in Hebron, where he reigned for seven years. One thousand years later, during the first Jewish revolt against the Romans, the city was the scene of extensive fighting. Jews lived in Hebron almost continuously throughout the Byzantine, Arab, Mameluke, and Ottoman periods. It was only in 1929 — as a result of a murderous Arab pogrom in which 67 Jews were murdered and the remainders were forced to flee — that the city became temporarily "free" of Jews. After the 1967 Six-Day War, the Jewish community of Hebron was re-established. It has grown to include a range of religious and educational institutions. Hebron contains many sites of Jewish religious and historical significance, in addition to the Tomb of the Patriarchs. These include the Tombs of Othniel Ben Kenaz (the first Judge of Israel) and Avner Ben Ner (general and confidante to Kings Saul and David), and Ruth and Jesse (great-grandmother and father, respectively, of King David). In recent years, Hebron has been the site of many violent incidents, two of which stand out. In May 1980, Palestinian terrorists murdered 6 Jewish yeshiva students and wounded 20 others, who were returning from prayers at the Tomb of the Patriarchs. In February 1994, Dr. Baruch Goldstein opened fire on Muslim worshippers at the Tomb, murdering 29 and wounding 125. Goldstein, a supporter of Meir Kahane’s Kach party, was subsequently killed by the survivors in the mosque, and is buried inside Kiryat Arba. A shrine was erected at his grave shortly after the mosque attack, but was demolished by the Israeli government in 2000. After the signing of the Israeli-Palestinian Interim Agreement ("Oslo II"), authority for most civil affairs regarding Hebron's Arab residents was transferred from the Israeli Civil Administration to the Palestinian Authority and the (Arab) Municipality of Hebron. Those services which remained the responsibility of the Civil Administration will be transferred following the IDF redeployment from Hebron. The IDF retains sole responsibility for the security and well-being of Hebron's Jewish community. Hebron — located south of Jerusalem in the Judean hills — is home to approximately 130,000 Arabs, 530 Jews, and three Christians. Today, Jews living in the oldest Jewish community in the world which contains the Tomb of the Patriarchs are outnumbered 245 to 1 by Arabs who are mostly followers of Islam. In spite of overwhelming odds, there will be a “Great and Terrible Day” coming when the clans of Judah will defeat the armies of the nations.